25p Where's my little lad? 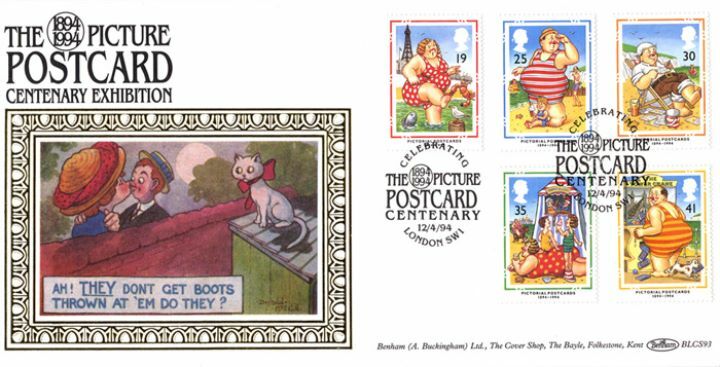 The above Royal Mail Picture Postcards stamps were issued on 12 April 1994 by Royal Mail and feature the following stamp designs: 19p Blackpool; 25p Where's my little lad? ; 30p Wish you were here; 35p Punch and Judy; 41p The Tower Crane. The Centenary Exhibition first day cover with the London SW1, Picture Postcard Centenary, Special Handstamp postmark has been produced by Benham and features these stamps which can make a very collectible and lovely gift.